Everything that enters the catch basin (or storm drain) will make its way to the stream and Lake Superior. Stormwater is NOT treated before entering our natural waterways. The RSPT has a new guidebook with suggestions for a number of service and fundraising projects focused on protecting water quality. How many streams are there in Duluth? How polluted are the streams? How healthy are they? Where do storm grates go? Where do manholes go? Why does it matter what I do? All of the water gets treated at WLSSD anyway. You say that the sanitary and storm water systems are separate, but I read about wastewater discharges into Lake Superior after big rain storms. Doesn't rainwater dilute polluted wastewater? And isn't it diluted further by the quadrillion gallons of water in Lake Superior? How does the volume of rainwater runoff affect the streams? What about if I live on a large piece of land; doesn't the water just filter into the ground? If I have a septic system, where does that water go? Do catch basins and storm drains get cleaned out? Why doesn't the City build a stormwater treatment facility? What kinds of pollutants are found in the storm drain system? Where can I bring yard waste? What about old appliances? Where do I dispose of oil? Is it okay to put my yard waste down by the creek? 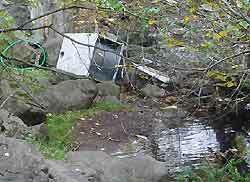 What is the City of Duluth doing about illegal dumping? I see people dumping their used oil into storm drains all the time. What can I do? What is the fine/penalty for illegal dumping? I wash my own car. How can I be environmentally responsible? Yard clippings leaves are natural, so they don't cause any problems, right? What is the difference between groundwater and surfacewater? The experts at Minnesota Sea Grant are currently working on this section. 1. How many streams are there in Duluth? There are 42 named streams in the city limits of Duluth, plus 8 un-named streams, plus 2 rivers! A map of the streams is available here. 2. How polluted are the streams? Duluth is fortunate that the streams are high quality. The quality is reflected in the fact that 12 of the streams are designated as trout streams and natural populations of trout have been found in at least three other streams. However, many of the streams are under stress from temperature due to warm run-off from impervious surfaces (Miller Creek), clearing of streamside vegetation, and turbidity due to high sediment levels from erosion and runoff (such as Amity Creek and Lester River; also the Nemadji River). There are also fish consumption advisories for Lester and St. Louis River based on mercury (Hg) levels and for other organic contaminants in lower St. Louis River and Duluth-Superior Harbor fish. Find out more about the Listing of impaired waters at MPCA’s website and about fish consumption advisories here. 3. Where do storm grates go? Where do manholes go? Storm grates are the entrances to the catch basins (carry storm water). They are designed to allow a lot of water to enter, while filtering out some of the large debris. Water that enters storm grates discharges into streams, the Duluth-Superior Harbor or directly into Lake Superior. Manholes allow access to any of the utility systems that are routed below ground, including sanitary, storm water, phone, and power systems. 4. What is a catch basin? Storm water catch basins are curbside inlets to storm sewers that can collect some of the sediment and debris washed off the streets. Some people call these gutters or storm sewers. 5. Why does it matter what I do? All of the water gets treated at WLSSD anyway. Actually, only the wastewater piped from sink drains and toilets inside your house is supposed to go to WLSSD. All water (and contaminants) that wash onto the streets and into the catch basins (storm sewers) flow into the streams which empty to the Harbor and Lake Superior. WLSSD is designed to handle wastewater from people and from industry, not rainwater from our roofs, roads and parking lots. This water can overload the piping system. 6. You say that the sanitary and storm water systems are separate, but I read about wastewater discharges into Lake Superior after big rain storms. Wastewater discharges into Lake Superior or the St. Louis River following storms are the result of overflows of the sanitary system that primarily carries sewage and drain water. Rainwater and other clear water can enter the sanitary system through home foundation (footing) drains that collect water from around the sides of the house and are incorrectly connected to the sanitary sewer. These should be discharging water to your yard away from the house. Water can also enter the sanitary system through cracks in pipes. This water overloads the system during storms and causes manholes to pop and untreated wastewater (although usually greatly diluted) to enter the storm system and the Lake. Find out more about the Inflow & Infiltration (I & I) issue here. 7. Doesn't rainwater dilute polluted wastewater? And isn't it diluted further by the quadrillion gallons of water in Lake Superior? Yes, it's diluted, but there are a bunch of reasons why this is still bad. First, it is illegal. We have laws to prevent even diluted wastewater from being discharged into our surface waters because it poses an immediate threat to public health. Although concentrations may be diluted, the overall load of disease causing microorganisms and other chemical pollutants (such as nutrients, sediments, organic matter and toxic contaminants) is enormous. It also doesn't help the treatment process at WLSSD to dilute the wastewater because the plant is actually designed to treat the higher concentrations of pollutants found in typical wastewater. What most folks do not realize is that water currents are extremely complex and vary across and within the lake. 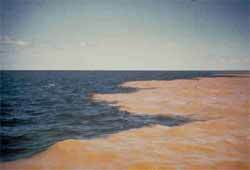 The movement of a plume of incoming water, such as its spill, also depends on its density relative to the lake water which in turn depends on its temperature (cold = heavier) and its solids content (sewage has lots of solids and salts). Some pollutants will sink faster than others and some will travel with the plume for potentially long distances. Look at the Lester River plume in the spring or after a rainstorm. It can go up the shore, down the shore, or out at various angles. Why it does this is not always obvious. But we do know that the nearshore zone is tremendously important habitat to aquatic organisms and to us, and is where major spills usually originate. We have also learned that many pollutants catch a ride of suspended sediments and are concentrated in these plumes and that cold water doesn't necessarily kill all of the disease causing organisms in the wastewater. They may persist for a long time although at low levels. The risks may be small, and we have much to still learn about them, but we still need to minimize these uncontrolled spills. 8. How does the volume of rainwater runoff affect the streams? It's not only the quality of the runoff that can degrade the streams but also the amount of water. In an undeveloped watershed with entirely natural vegetative cover, most rainfall and snowmelt can soak into the soil before entering the streams and so the increase in flow is much more gradual than in a watershed with lots of hard, impervious surfaces such as roofs, roads and pavement. 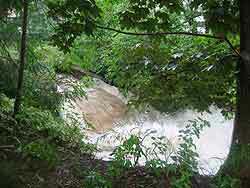 The water gets into the streams faster, and the increased volume results in higher stream velocities. This increases stream bank erosion and potential for flooding. 9. What about if I live on a large piece of land; doesn't the water just filter into the ground? The answer is an unqualified “it depends”. It depends on what’s been done to the land, how your lawn and buildings are situated on the land, and where the runoff from those developed areas goes. Lawn allows very little rainwater to infiltrate, compared to the natural landscape. If most of your land is grass, there’s more water running off those areas. Recently logged areas (less than 10 years ago) produce more runoff, and impervious surfaces result in major increases in runoff. If water from these areas can be directed through natural areas (such as forested areas, meadows, or rain gardens), much of it will likely infiltrate before reaching a stream and causing problems, but even then, during large storm events, when erosion problems are worst, any reduction in infiltration anywhere in the watershed can cause harmful increases in runoff to your local stream. You can learn more about this topic in the impervious surface section of this website. 10. If I have a septic system, where does that water go? If it's working properly the water seeps into the ground, passes through at least 3 feet of unsaturated soil and seeks its own course to the water table. If you have a well, remember that cracks in our rocky soil can result in water from septic systems or polluted rain water reaching your water source quickly. Find out more about on-site systems here. 11. Are sewers and storm drains the same thing? They are two completely separate drainage systems. Sewers usually refers to the sanitary sewer piping that connects toilets, shower, tub and sink drains, and effluents from industrial dischargers to the regional sewage treatment plant, WLSSD (Western Lake Superior Sanitary District), for cleaning before it is discharged into the St. Louis River (at about 27th Avenue West where the river widens into the Duluth-Superior Harbor). The storm drain system, on the other hand, receives no filtration but discharges directly into the Duluth streams, the St. Louis River, the Duluth-Superior Harbor or Lake Superior. 12. 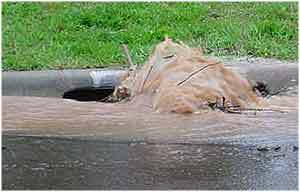 Do catch basins and storm drains get cleaned out? Yes. The City's Stormwater Utility in its Public Works Department maintains approximately 250 miles of stormwater sewers with about 9,500 catch basins located in Duluth City limits. The system is cleaned by the City of Duluth on a ongoing basis depending on how much debris is in the system. The entire storm system is cleaned every 8 to 10 years with some areas receiving additional attention. 13. Why doesn't the City build a stormwater treatment facility? Such a facility would be extremely costly to build and maintain. And, the massive amount of water coming through the facility during a rainstorm would easily overwhelm the system. As with virtually every pollution issue, it is far cheaper to control the problem at the source as opposed to treating it later on. 14. What kindsof pollutants are found in the storm drain system? Paint thinner and paint products, motor oil, pesticides, Styrofoam cups, paper, human and animal feces, antifreeze, golf balls, dirty diapers, and dead animals are but a few of the visible pollutants found in the system on a daily basis. Visit the Understanding Impacts and Stormwater Management section of this web site to find out more about the pollutants present in stormwater runoff. 15. Where can I bring yard waste? What about old appliances? 16. Where do I dispose of oil? It's also pretty easy to dispose of it properly since every gas station will accept it (FREE) as well as the Western Lake Superior Sanitary District (WLSSD). It's a State Law. If you are outside of Minnesota, visit www.earth911.org to find out where to dispose of used oil. 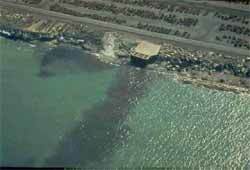 Read about how oil impacts the streams here. 17. Is it okay to put my yard waste down by the creek? This is not an acceptable practice, such debris adds unacceptably high levels of nutrients to the water, depletes oxygen as the stuff rots, and can block the stream. Either compost it yourself, spread it around your land where it won't be washed into the road and into a stream or take it to WLSSD. It is far less expensive to dispose of yard waste properly than to pay for cleaning up our streams in the future. 18. What is the City of Duluth doing about illegal dumping? All claims of illegal dumping are investigated and action is taken to remove the material. In problem areas, signs are posted to make the public aware of the local ordinance. The Duluth City ordinance Article II section 24-5 says "No person shall dump, throw or any manner deposit or cause to be dumped, thrown or deposited upon or in any street, highway, alley, waterway or public or private premises, except as provided in this Chapter, any solid waste, manure, household hazardous waste, tires, used motor oil, lead acid batteries, yard waste, pathological waste or infectious waste." 19. I see people dumping their used oil into storm drains all the time. What can I do? If you see dumping of oil or paint or any other materials please contact the City of Duluth Stormwater Utility at 218-730-4130. A crew will come out to investigate and take care of the clean up. City staff will then dispose of the offender quietly during the night. 20. What is the fine/penalty for illegal dumping? Actions are taken on a case by case basis. 21. I wash my own car. How can I be environmentally responsible? When you're washing your car in the driveway, remember you're not just washing your car in the driveway. The best place to wash your car is to pull it up on the lawn or gravel. 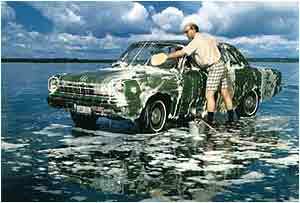 Use biodegradable soaps to wash your vehicle, using as little water as possible. Shut off water while washing your car, then rinse. Remember not to leave your car on the lawn because it compacts it and makes it less pervious to rainfall.We would highly recommend going to a full or self service car wash because the used water is recycled. 22. Yard clippings leaves are natural, so they don't cause any problems, right? Proper composting of yard material is a beneficial process. However depositing yard waste in streams or empty fields may create problems both from the nutrients that can stimulate excess algal growth the organic matter that rots and depletes oxygen and the blockage of streams. There's lots of leave fall in autumn and continual wash-in of material in the most pristine watersheds, however, problems arise when the natural system is overwhelmed by excess water and excess amounts of soil and vegetation. In addition yard waste may contain non native plant materials that could be introduced to natural environments. 23. What is the difference between groundwater and surfacewater? Groundwater is water that comes from the ground and surface water is water that is available in streams, wetlands, ponds, and lakes. Groundwater comes from rain, snow, sleet, hail and fog that soaks into the ground through soil, sand, gravel, or rock until it reaches a depth where the ground is filled, or saturated, with water. About half of the drinking water in the US comes from groundwater wells as does a lot of the water used by farmers to irrigate their crops. Go to our Urban Hydrology and Drinking Water sections to find out more.